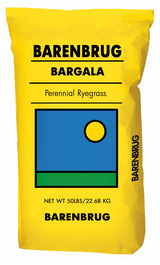 Orchardgrass is valuable on light textured soils due to its outstanding drought-tolerance. Most varieties have good winter-hardiness, although few varieties have superior winter-hardiness. The species is rather slow to establish but persistency is good under hay, silage, and proper grazing management. After it starts growing in the spring, orchardgrass tends to head very quickly. Late heading varieties therefore can provide more flexibility in management options. 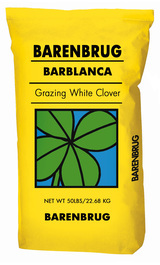 Late maturing orchardgrass is also popular as a companion grass for alfalfa. Years of breeding efforts goes into improving the forage quality and simultaneously the forage yield of orchardgrass varieties. 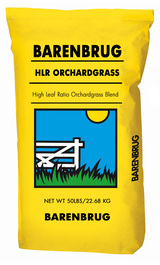 High Leaf Ratio Orchardgrass Blend contains the best and latest orchardgrass varieties from Barenbrug’s breeding program. The varieties have been selected for high leaf to stem ratio. This means more leaves for improved digestibility and energy, and less stems that reduce the feed quality and palatability of the forage. New diseases keep appearing in orchard grass stands. Barenbrug breeders are continuously selecting for disease tolerance and HLR Orchardgrass is tolerant to rust and other leaf diseases. The intermediate to late heading varieties in HLR are ideal for planting with alfalfa.